You’ve seen one office, you’ve seen them all, right? No, I hope not! But, that is what some people think. For most types of businesses, there is a culture that goes along with it, and unique needs for its form and function. Follow me on this thought process for a minute. I’ll say the type of business and then what comes to mind. First, let’s see if we think the same thing. All of these are stereotypes, right? And that’s fine. There are trendsetters out there, however that want more. They want something fresh! Something different! No matter what field they work in, this buyer is looking for key pieces that say something. So, for those who want to chart a course that shows their originality, there are inventive new furniture collections to consider. Brands like Nevers, Spec, Darran, Creative Wood, Watson and many others have taken a fresh approach to making a client’s vision become a reality. From custom conference tables with gorgeous exotic wood or textured inlays to chairs with design elements that defy convention, your office furniture absolutely doesn’t need to be boring! 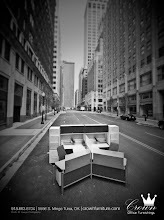 Why can’t your furnishings make an inspired statement in your place of business? There are ground-breaking looks available at all different price points to help achieve that high design you crave. 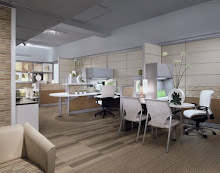 Board rooms, reception areas and executive offices are typically the places you will want to focus your budget and design collaboration on. So start there! 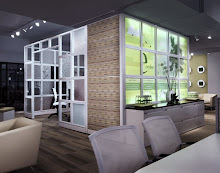 A qualified interior designer or an experienced, design oriented sales person are your best alliance in perceiving your vision and then bringing it to life within your space. They will be able to help you focus your dollars on which pieces are splurge-worthy and others you can save money on. In some stores, you will get the benefit of both. Many stores work with designers or have them on staff. This type of joint effort is invaluable in helping you to achieve the final gratifying result of pulling the whole space together. Think beyond the basic and boring when it comes to your furniture. Get inspired! 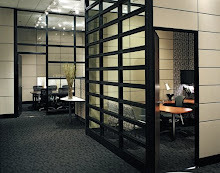 Create a chic, customized space that tells your clients that your business is moving forward, while doing it with style! So true about the different office stereotypes. Sadly, many small business owners think they have to imitate the "big boys" instead of taking advantage of the opportunity to create a unique look for their office environment. Ironically, this is actually easier to do as a startup since you only need to buy a few pieces instead of an entire fleet of workstations. The chair looks great and I am sure is comfy. I have just noticed that you have the same fabulous floor lamp with the black-and-white shade from Target that I do, in my study. My walls are still green, a darker shade though. Will post it some day.